Gen. Robert E. Lee concentrated his full strength against Maj. Gen. George G. Meade’s Army of the Potomac at the crossroads county seat of Gettysburg at what would come to be known as the Battle of Gettysburg. On July 1, Confederate forces converged on the town from west and north, driving Union defenders back through the streets to Cemetery Hill. During the night, reinforcements arrived for both sides. On July 2, Lee attempted to envelop the Federals, first striking the Union left flank at the Peach Orchard, Wheatfield, Devil’s Den, and the Round Tops with Longstreet’s and Hill’s divisions, and then attacking the Union right at Culp’s and East Cemetery Hills with Ewell’s divisions. By evening, the Federals retained Little Round Top and had repulsed most of Ewell’s men. During the morning of July 3, the Confederate infantry were driven from their last toe-hold on Culp’s Hill. In the afternoon, after a preliminary artillery bombardment, Lee attacked the Union center on Cemetery Ridge. 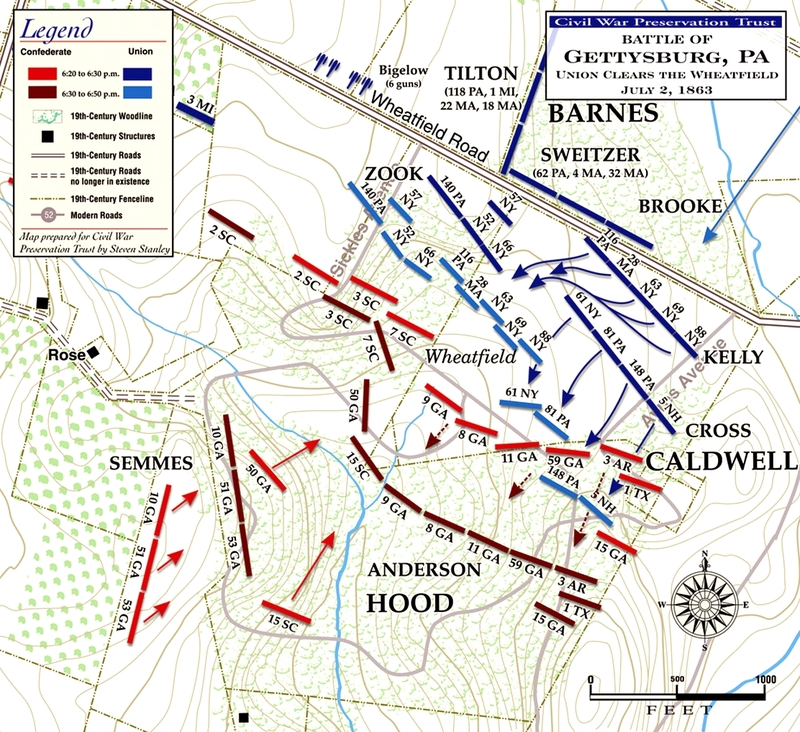 The Pickett-Pettigrew assault (more popularly, Pickett’s Charge) momentarily pierced the Union line but was driven back with severe casualties. Stuart’s cavalry attempted to gain the Union rear but was repulsed. On July 4, Lee began withdrawing his army toward Williamsport on the Potomac River, thus concluding the Battle of Gettysburg. His train of wounded stretched more than fourteen miles. Charge and counter charge on the afternoon of July 2 left this field and nearby woods strewn with more than 4,000 dead and wounded Union and Confederate soldiers. Thousands of troops fought in this area and veterans compared it to a whirlpool- a stream of eddies and tides that flowed around the 19 acres of wheat owned by farmer George Rose, that changed hands six times. 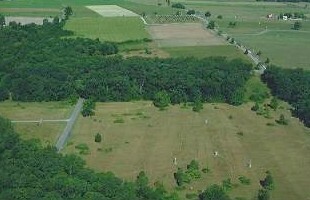 This aerial view of the field is toward the west with the Peach Orchard at the central top. The woods that border the field were not as dense in 1863 as they are today, but they did provide cover for the Confederates as they maneuvered around Union positions here. 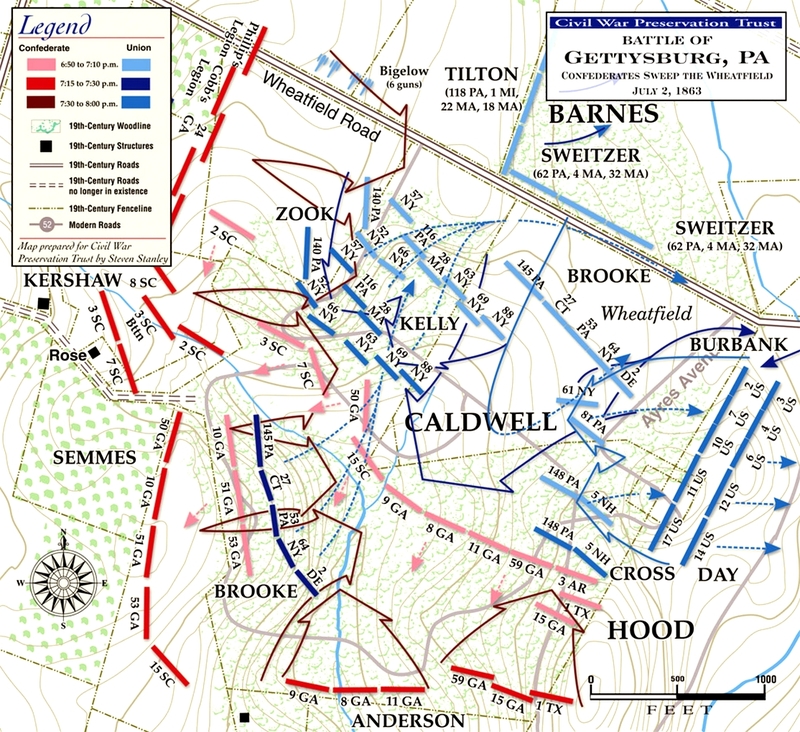 Fighting began in earnest around 4:30 when a Georgia Brigade commanded by Brig. General George Anderson swept through the woods to the south and ran into Brig. General Regis deTrobriand's Union regiments stationed behind a stone wall on the southern end of the field. Some of deTrobriand's regiments had been peeled off to support the positions at Devil's Den, and though he was outnumbered by Anderson's larger regiments, his remaining soldiers kept the Confederates at bay for nearly an hour. (Right) Picture of soldiers who fought in the Wheatfield, a platoon of the 110th Pennsylvania Volunteer Infantry. National Archives. Anderson skillfully maneuvered his soldiers in front of the Union troops, conserving ammunition and manpower, while the overtaxed Northerners stubbornly held their position. Re-enforcements were desperately needed as ammunition ran out. DeTrobriand's 17th Maine Infantry had used up all of their ammunition and ordered to withdraw, the regiment backed through the Wheatfield closely followed by Anderson's men who triumphantly swarmed over the wall. General David Birney, commanding this section of the line, ordered the 17th Maine to about face and led them in a desperate bayonet charge. 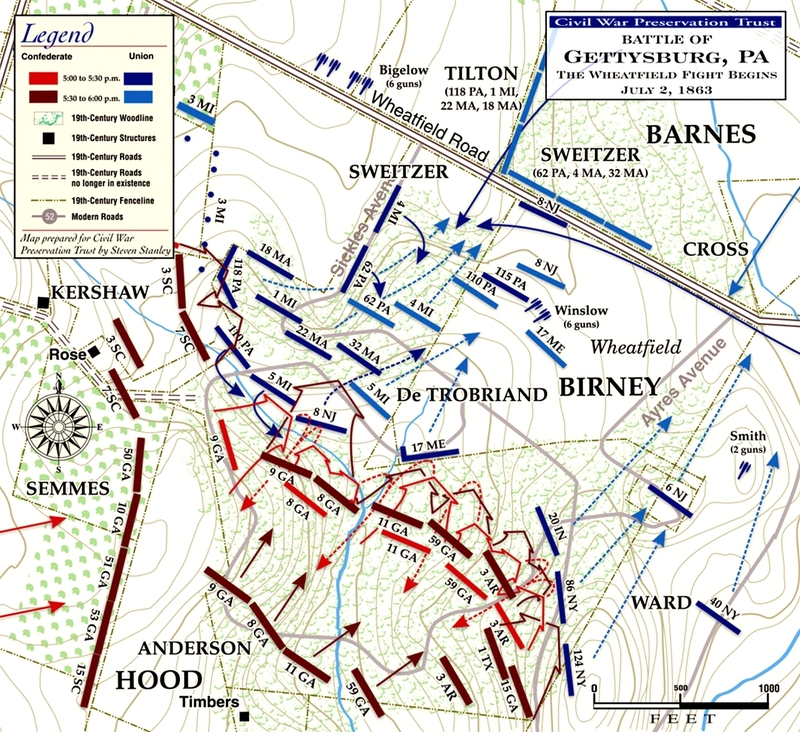 Birney's counterattack temporarily swept Anderson's men from the field, but the Southerners were not to be denied. Rallied by their officers, the Georgians renewed their attack as Union re-enforcements marched onto the scene. As the fighting raged in the southern end of the Wheatfield, Union troops filtered into the woods to the east and west to slug it out with Confederates moving in from the direction of the Rose Farm. 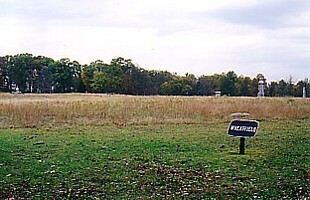 General Kershaw's Brigade of South Carolina soldiers crossed the Rose Farm and attacked Union troops on a small rocky knoll that borders the west side of the field. The fighting swelled to a crescendo and raged steadily for a hour, when the Union troops began to pull out. The famous Irish Brigade arrived and tramped through the Wheatfield to, in turn, push the Confederates off the knoll. A determined Kershaw threw his men back into the attack, re-enforced with a Georgia Brigade under Brig. General Paul Semmes. Semmes led two of his regiments into a gap on Kershaw's right in the lower part of the Wheatfield, where he was seriously wounded and his men counterattacked by a fresh Union brigade under Colonel John Brooke. At the point of the bayonet, Brooke's small regiments drove Semmes' men back to the Rose Farm orchards south of the house and the two sides fought it out in a see-saw struggle. Southern pressure was relentless and the Union forces began to withdraw from the Wheatfield and surrounding woods. The fighting was close and, for a time, hand to hand. Colonel Harrison Jeffords of the 4th Michigan Infantry was bayoneted by a Confederate soldier as he rushed to save the flag of his regiment from capture. Finally, Brig. General Wofford's brigade swept the field and all was quiet except for the groans of the thousands of wounded and dying. George Rose's Wheatfield is truly one of the bloodiest sites on the battlefield. Earlier that afternoon, as Meade realized the folly of Sickles's movement, he ordered Hancock to send a division from the II Corps to reinforce the III Corps. Hancock sent the 1st Division under Brig. Gen. John C. Caldwell from its reserve position behind Cemetery Ridge. It arrived at about 6 p.m. and three brigades, under Cols. Samuel K. Zook, Patrick Kelly (the Irish Brigade), and Edward E. Cross moved forward; the fourth brigade, under Col. John R. Brooke, was in reserve. Zook and Kelly drove the Confederates from Stony Hill, and Cross cleared the Wheatfield, pushing Kershaw's men back to the edge of Rose Woods. Both Zook and Cross were mortally wounded in leading their brigades through these assaults, as was Confederate Semmes. When Cross's men had exhausted their ammunition, Caldwell ordered Brooke to relieve them. By this time, however, the Union position in the Peach Orchard had collapsed, and Wofford's assault continued down the Wheatfield Road, taking Stony Hill and flanking the Union forces in the Wheatfield. Brooke's brigade in Rose Woods had to retreat in some disorder. Sweitzer's brigade was sent in to delay the Confederate assault, and they did this effectively in vicious hand-to-hand combat. The Wheatfield changed hands once again. 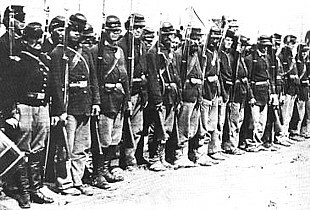 Additional Union troops had arrived by this time. The 2nd Division of the V corps, under Brig. Gen. Romeyn B. Ayres, was known as the "Regular Division" because two of its three brigades were composed entirely of U.S. Army (regular army) troops, not state volunteers. (The brigade of volunteers, under Brig. Gen. Stephen H. Weed, was already engaged on Little Round Top, so only the regular army brigades arrived at the Wheatfield.) In their advance across the Valley of Death they had come under heavy fire from Confederate sharpshooters in Devil's Den. As the regulars advanced, the Confederates swarmed over Stony Hill and through Rose Woods, flanking the newly arrived brigades. The regulars retreated back to the relative safety of Little Round Top in good order, despite taking heavy casualties and pursuing Confederates. The two regular brigades suffered 829 casualties out of 2,613 engaged. This final Confederate assault through the Wheatfield continued past Houck's Ridge into the Valley of Death at about 7:30 p.m. The brigades of Anderson, Semmes, and Kershaw were exhausted from hours of combat in the summer heat and advanced east with units jumbled up together. Wofford's brigade followed to the left along the Wheatfield Road. As they reached the northern shoulder of Little Round Top, they were met with a counterattack from the 3rd Division (the Pennsylvania Reserves) of the V Corps, under Brig. Gen. Samuel W. Crawford. The brigade of Col. William McCandless, including a company from the Gettysburg area, spearheaded the attack and drove the exhausted Confederates back beyond the Wheatfield to Stony Hill. Realizing that his troops were too far advanced and exposed, Crawford pulled the brigade back to the east edge of the Wheatfield. The bloody Wheatfield remained quiet for the rest of the battle. But it took a heavy toll on the men who traded possession back-and-forth. The Confederates had fought six brigades against 13 (somewhat smaller) Federal brigades, and of the 20,444 men engaged, about 30% were casualties. Some of the wounded managed to crawl to Plum Run but could not cross it. The river ran red with their blood. As with the Cornfield at Antietam, this small expanse of agricultural ground would be remembered by veterans as a name of unique significance in the history of warfare. (About) "Harvest of death," photograph by Timothy O'Sullivan of Union dead. 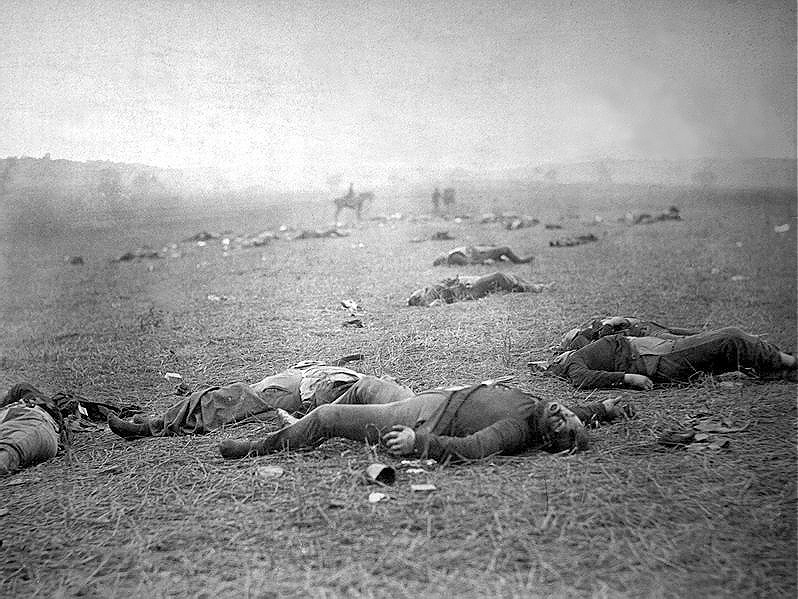 Although this is one of the most circulated photographs of Civil War dead, Frassanito, pp. 315-18, states that the location of where this photograph (his plate "104b") was taken is unknown, but he groups it with others near the Rose Farm and confirms that the dead are Union. Library of Congress. Two generals were mortally wounded during the severe contest in the Wheatfield. Shot in the leg as he led his troops toward the Wheatfield, Brig. General Paul Semmes was carried back to a field hospital that night. Weak and pale from loss of blood, Confederate surgeons did all they could to save the general's life. After treatment by the surgeons, the general was taken by ambulance to Martinsburg, West Virginia for further medical care and he appeared to be improving. Then an unstoppable infection set in and there was little the doctors could do to stop it. Semmes lingered in great pain until his death on July 10. The blood-stained uniform coat the general wore at Gettysburg is preserved in the collection of the Museum of the Confederacy in Richmond, Virginia. Like General Semmes, Brig. General Samuel Kosciuszko Zook was wounded as he led his brigade into action to engage Confederates in the woods on the west side of the Wheatfield. Born in Pennsylvania and raised near Valley Forge, the charismatic officer commanded one of four brigades from the Second Corps that were rushed to the scene that afternoon. To get his regiments into the field, General Zook ordered his soldiers to march over a prostrate line of disorganized Union soldiers and had ridden ahead of his men when he was struck in the abdomen by a Confederate bullet. Aides carried the general to an ambulance that transported him to a Union field hospital on the Baltimore Pike. Here, surgeons pronounced the wound mortal and the general died soon after midnight. General Zook is buried in Norristown, Pennsylvania. (About) A Union soldier killed by a shell in "the Wheatfield" at Gettysburg, July 3, 1863. His arm is torn off and the shell completely disemboweled him. Set in the woods adjacent to the Wheatfield is one of the park's more impressive and memorable monuments dedicated to the memory of the three New York regiments of the "Irish Brigade", raised from the Irish population of New York City. Many of the soldiers in these celebrated regiments were immigrants who had come to the United States to escape political repression and the "Potato Famine" of the 1850's when thousands starved to death. The brigade was the brainchild of Thomas Francis Meagher, an Irish-born transplant and ambitious activist who began the war as a captain in the 69th New York Militia. Meagher returned to New York from the battlefield of First Bull Run, obsessed with organizing an entire brigade of Irish regiments. Over 2,500 Irish soldiers were recruited to fill the ranks of the 63rd, 69th, and 88th New York Infantry Regiments of the new brigade, which was later joined by the 28th Massachusetts Infantry. Appointed brigadier general in 1862 and given command of the brigade, Meagher drilled his regiments in the defenses of Washington before they were sent to join the Army of the Potomac. The brigade fought with great distinction and great gallantry during the Peninsula Campaign (aka Peninsular Campaign), Antietam, and at Fredericksburg where the brigade suffered high casualties in the attack against fortified Confederate positions. By the opening of the Gettysburg campaign, the brigade, including the 116th Pennsylvania Infantry, barely mustered 530 men; 198 became casualties during the battle within these woods. 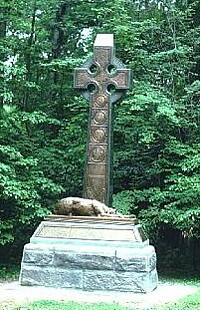 In 1888, a handful of veterans returned to Gettysburg to dedicate their monument of green granite topped by a Celtic cross and adorned with the likeness of an Irish Wolfhound, the traditional Irish symbol of loyalty. The work of sculptor Rudolph O'Donovan, it is one of the more unique monuments in the battlefield park. And rear aloft in all its pride, fair Freedom's flag again! Who showed mankind the way to die, when Truth and Freedom led." -from Our Fallen Comrades, by William Collins, 1888. Sources: National Park Service; Gettysburg National Military Park; Civil War Trust. About the Author: Jay Jorgensen earned a bachelor’s degree in history from Fairleigh Dickinson University and received his juris doctorate from Villanova University School of Law. He has a Master of Arts degree in military history and Civil War studies from American Military University. He is a partner in the law firm of Jorgensen & Barnes and also serves as a municipal court judge in New Jersey. Jay is a frequent presenter at Civil War Round Tables and has had six articles published in Gettysburg Magazine. He lives in Colonia, New Jersey, with his wife and two sons.